Wichita: A Tough Town for Love? 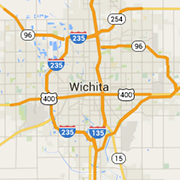 Home > Blog > Lifestyle > Wichita: A Tough Town for Love? A reporter from KMUW recently interviewed me to ask me some questions about dating in Wichita. Some of my answers were used in a piece that aired last month on Valentine’s Day. The piece also included the perspectives of several young single men and women and they all supported the reporter’s thesis that Wichita has a reputation for being a difficult city for dating. It’s incredibly expensive to go out. Young people, in particular, equate the first meet with an investment! The anonymity and disconnectedness of a massive metropolitan area can make people feel less obliged to be civil, respectful and kind; flaky or obnoxious behavior is more normalized. So you see, Wichita is not alone in its bad attitude about dating. Many of my clients (particularly those in middle age or older) have lamented that it's a big small town, (or a small big city, depending on where you come from!) you want to look at it. That means that an active dater can draw 2-3 points of “connection” between herself and the man she just went out with. With minimal effort, one can dig up some “dirt” on the object of their affection. This lack of a true blank slate can be disadvantageous. I advise people to do enough due diligence to feel safe, but not so much as to give themselves a distorted or biased view of the person they’re meeting. Many of my female clients (and a few men too) who are well-educated and well-employed feel like they have exhausted the local dating market in terms of what they're looking for, so I encourage them to cast their net regionally and include Kansas City, Tulsa, and Oklahoma City in their search. This is not unreasonable if you are in the stage of life where your children are grown. While I know Wichita is challenged to retain our residents, there is no better reason to move than to pursue a great career or a great love. The other great affliction of dating is the perception of abundance created by digital dating. It’s almost foolish not to use the tool that is online dating or dating apps, but we must be aware of how they change our brains and the illusion of choice that they create. Some years ago a psychologist named Barry Schwartz published a book called "The Paradox of Choice” that describes how, when we have the perception of having plentiful options available to us, we tend to be not only pickier and choosier but we also tend to make choices that ultimately are less satisfying. I used to think that the maximum number of choices in any situation was desirable, but endless choices don’t correlate with happiness. What ends up happening is we put off making a choice altogether, which means you swipe ad infinitum and you stay single. Be active on at least two. Commit to being online for six months or longer. Maintain reasonable expectations. Another way to say this is: Keep simple expectations. Make the best profile you can (and get some outside help on this) then release the outcome. If your outcome is to have fun, you can't lose. You’ll meet some amazing people – and when you meet some awful people, you’ll have entertaining stories! My outcome when I dove into dating apps was to just meet some cool people and have some interesting conversations. I was not necessarily looking for a committed relationship. I thought I'll probably collect some good stories that I can use with my clients as “learning opportunities.” I had easy expectations. And that's when the magic happened. You don't get to say that you gave it an honest effort until you've met these criteria. If you think it is hard to date . . . if you find it hard to spark a conversation . . . if you are uncomfortable in bars and breweries . . . if you suspect you’re missing out on meeting new people, it’s time to look at fixing some things. Sure, each demographic area has its own problems, but you can’t blame Wichita for your dating challenges forever. (Or you can, but you’ll be playing the blame game solo.) In this era, you don’t have to feel isolated. When we work with clients, we look at the things that are limiting their success. Maybe you’re connecting with people who seem super awesome at first, and then they turn out to be a disappointment. We help screen for that. We help guide the conversation to avoid that. We help “fine tune” your picker. Maybe you get really nervous when you talk to new men or women. Maybe you get attracted and your brain just freezes and the words won’t come. We have processes to get you through that – and minimize how and when it happens in the future. The quickest thing you can do to get the most immediate shift is to give up your addiction to instant gratification. Stop mindlessly, callously swiping through profiles; every person behind the profile is a real-life human being with wants, needs, fears, frustrations and so on – just like you. So, stop “shopping.” Only look at a handful of profiles each day, then discipline yourself to stop swiping. What good is it to have a world of singles at your fingertips when they’re all disposable? In the blink of an eye, swipe! They’re gone. That trains your brain to see them as a throwaway.